ENUGU—Enugu State Governor and governorship candidate of the Peoples Democratic Party (PDP), Rt. Hon. 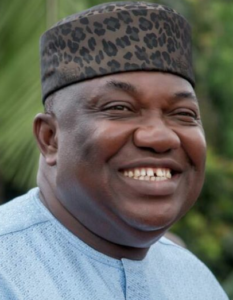 Ifeanyi Ugwuanyi, in continuation of his door-to-door campaign, stormed Obinagu Uwani Akpugo in Nkanu West Local Government Area, ahead of March 9 Governorship and House of Assembly Elections. The governor who canvassed for votes, displaying the PDP Logo (Umbrella), thanked the people of Enugu State for their support and peaceful conduct during the Presidential and National Assembly Elections. He urged them to come out en masse on March 9 to vote for the candidates of the party, proclaiming that the election will surely end in praise. Other speakers at the colourful event, such as the House of Representatives member-elect in the area, Chief Nnoli Nnaji;the House of Assembly candidate of the party, Rt. Hon. Iloabuchi Aniagu; the Council chairman, Hon. Ikechukwu Okenwa; and chairman of Governing Council, Institute of Management and Technology (IMT), Enugu, Deaconess Ifeoma Nwobodo, also expressed gratitude to the people for their massive support for the PDP during the last election and appealed to them to vote for candidates of the PDP in the coming exercise. They extolled the leadership virtues of Gov. Ugwuanyi as a good man, great achiever and humble leader with a rare act of simplicity that endears him to the people, urging the electorate to re-elect him.